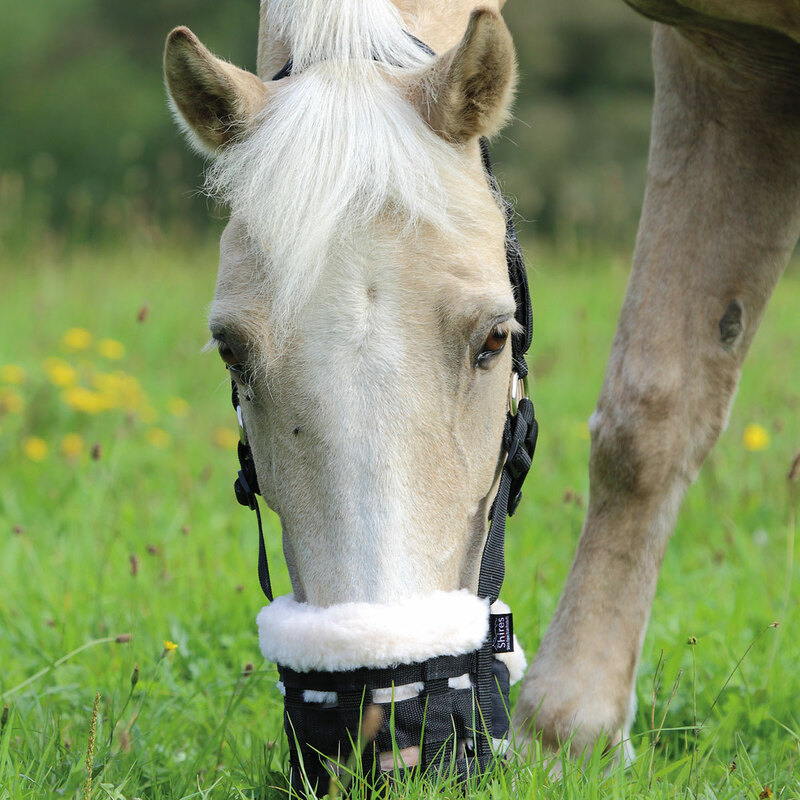 Shires grazing muzzles are proven to help with controlled or restricted feeding regimens and special diets. The Comfort Grazing Muzzles are cut back under the chin to avoid unnecessary pressure and improve the fit. The muzzle features a rubber base with a hole in the bottom through which grass can enter, reinforced nylon web bars which allow free air exchange and the anti-chafe padding around inside of the muzzle protects the delicate nose and chin. The head and throat straps benefit from anti-chafe padding and the fully adjustable harness is fitted with a field safe fastening. The D-ring allows a leadrope to be attached. 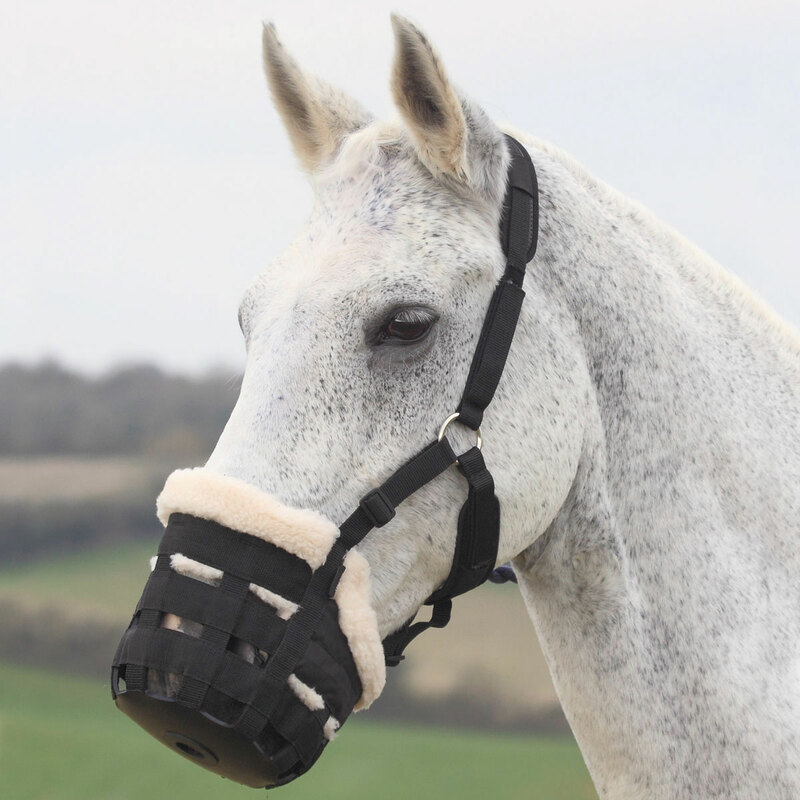 The Deluxe version of the Comfort Grazing Muzzle is lined with synthetic wool which helps protect against chafing and improves airflow around the delicate nose area. Shires Deluxe Comfort Grazing Muzzle is rated 3.9 out of 5 by 14. Rated 4 out of 5 by Lynn from good fit The padding really makes a difference with protecting our pony's skin - worth the investment. Rated 4 out of 5 by Lynda from Awesome! Excellent bucket! Did not rub his nose at all and for never having worn one before he didn't seem to mind it at all. Thought I would find it out in the pasture somewhere but he wasn't able to rub it off. The only downside was it did not have a snap or buckle to release instead of always having to pull apart the Velcro. Rated 3 out of 5 by Rfootie from Like the muzzle, hate the velcro closure Been using the muzzles in two horses for about a month. I really like the muzzle part, but the velcro closure is a pain! It is one velcro strap sandwiched between two straps. Difficult to close when a horse is anxious for turnout or has a fly bugging him. Snap hook at the side would be a great improvement. Rated 1 out of 5 by Susan from Poor design This muzzle has a very odd fit, and there is no snap or clip to put on or take off - just Velcro at the throat latch. Sent it back and will stick with Best Friends grazing muzzle. Rated 5 out of 5 by jonidesign from I love this muzzle! I was anticipating difficulties in getting our 3 horses to adapt to the grazing muzzle, but with just a little initial coaching, all of them took to eating and drinking with the muzzle. All have kept the muzzle on except for a couple of times and it must have been an incidental removal as they didn't try to ditch the muzzle in subsequent days. Also, these muzzles go through the washer just fine so it's easy to care for them. I'm so happy to have a safe way to graze my 2 chunky horses and 1 Cushings guy. Rated 3 out of 5 by zeeman007 from Weird sizing I bought the "small pony" size in this after the "pony" size in the Tough 1 was too big. I consider my little guy to be a small pony (11 hand shetland/welsh) but I couldn't even get this over his nose. The faux sheepskin is also looks like it would be impossible to clean. Thank goodness for SmartPak's return policy! Rated 5 out of 5 by Ali1 from I am amazed that my horse accepts the muzzle without complaint. I know she would rather not have it on but after founder this spring I feel the muzzle is a must. It is not rubbing anywhere on her face. Rated 5 out of 5 by Norm from Easy to put on and very comfortable I really like this Deluxe Comfort Grazing Muzzle as it is really easy to put on and take off of the horse. Just like a bridle. The fleece is so comfortable for the horse and very protective of chaffing and rubbing inside the cup. The only drawback about the fleece is if you have the horse near any brush or loose debris, it will catch on the fleece on the outside of the muzzle. But it is also easy to brush or pick off. A lint roller works great. I would highly recommend this muzzle over ones that do not have the fleece lining. Rated 2 out of 5 by Regina from Like the padding I have small size and he gets it off all the time. The pony size is too small. Rated 4 out of 5 by Regina from Sizing If he rolls small comes off. Pony size too small. I keep hoping he won'the roll.